As previewed on Halloween, when we broke down the Treasury's latest quarterly refunding, the US Treasury is set for a record round of Treasury note and bond auctions, selling a whopping $83 billion, up from $78 billion three months ago, and surpassing the prior all time refunding total set by Tim Geithner back in 2009. 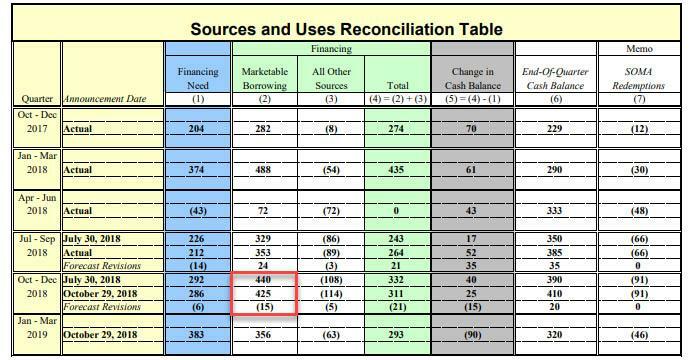 The total consists of $37BN in 3-Year, $27BN in 10-Year and $19BN in 30 Year Notes and Bonds. But before that, the week starts off in a frenzy of sales as the Treasury sells three- and six-month bills on Monday and four-, eight- and 52-week Bills ahead of a week crowded with the U.S. midterm elections, FOMC meeting and coupon auctions. 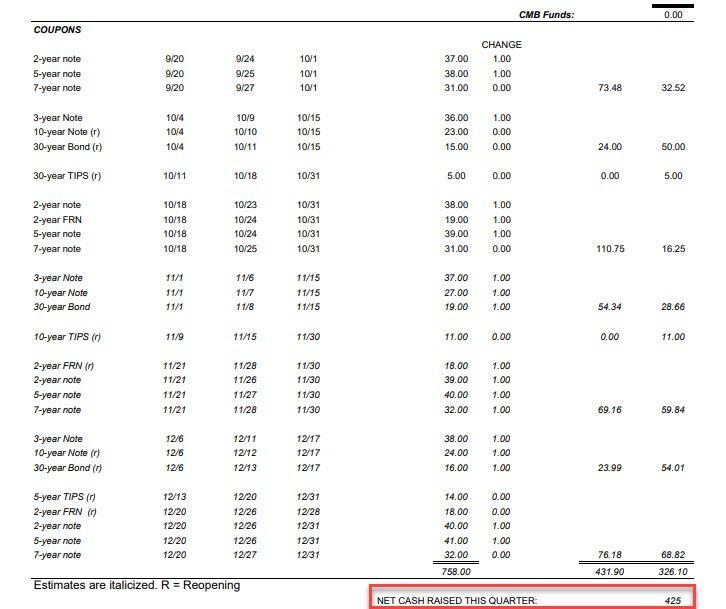 Specifically, the Treasury will auction $45b of three-month and $39BN of six-month bills at 11:30am ET on Monday; followed by $26BN of 52-week debt on Tuesday, while the sizes of four- and eight-week offerings will be unveiled at 11am ET on Monday. As we noted previously, the ballooning budget shortfall, fueled by Trump's tax cuts, spending hikes and an aging population, will result in a massive $1.34 trillion in total bond sales this calendar year. 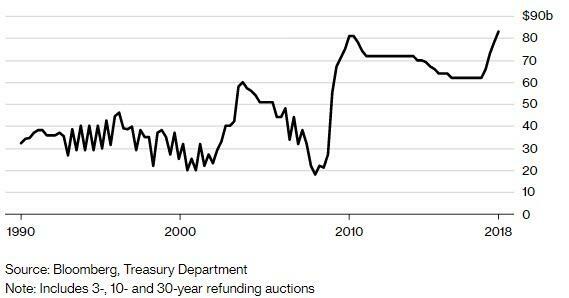 The need for the Treasury to raise auction sizes for a fourth straight quarter is also partially driven by the Federal Reserve’s decision not to replace some of its Treasury holdings when they mature as it winds down crisis-era stimulus measures. The rising US funding need has not been lost on market, which after last week's stronger than expected wage growth, ten-year rates reached 3.22%, closing in on the seven-year high of 3.26% set last month. The market will be closely watching what happens with yields today as any new breakout in yields, and a sharp steepening in the curve will likely lead to further weakness among risk assets. “It’s a sell-strength market in bonds,” said Brian Edmonds, head of interest-rate trading at Cantor Fitzgerald. “We know we are pushing up the size of every auction. So that all matters." Meanwhile, the Fed's Nov. 8 rate decision could result in even higher rates as the market expects Powell not to disclose anything material on Thursday: "The Fed could mail this one in because the market’s not expecting them to do anything magical at this meeting,” said Jim Caron, a fixed-income portfolio manager at Morgan Stanley Investment Management. However, that doesn’t mean Caron is complacent: "Given that the market expectation for this meeting is so sanguine, it’s a very low bar for the Fed to surprise, and they have many avenues to surprise us," he said. Quoted by Bloomberg, Caron is primarily interested in any hints from the Fed on its plans to wind down its $4.2 trillion balance sheet. A faster-than-anticipated reduction in its holdings of Treasuries and mortgage debt could drive yields higher. In the government-bond market, this would compound the pressure of increased issuance as the Treasury seeks to plug a deficit that’s headed toward $1 trillion. Still, according to Caron the Fed will likely play it safe since its statement won’t be accompanied by a press conference. This will be the last such Fed meeting. The Fed chief will face the media in December and after every policy decision starting in January.